General Motors Co. CEO Dan Akerson says the carmaker is studying how it could double or triple production of the new Chevrolet Volt plug-in hybrid should sales demand accelerate. About 250,000 potential buyers have expressed an interest in the vehicle, but production in 2011 will be just 10,000 units. 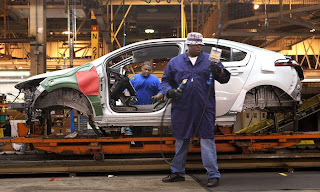 GM plans to build 45,000 Volts in calendar year 2012. Speaking on the sidelines of the official Volt launch ceremony on Tuesday at GM's Detroit-Hamtramck assembly plant, GM North America President Mark Reuss said that Volt production is constrained largely by vendor production of battery cells needed for the battery packs that GM assembles in suburban Detroit for the Volt. He said GM could begin exporting Volts to Europe and elsewhere by late 2011. The European version would be the Opel Ampera. GM global product chief Tom Stephens said GM also is considering a flex-fuel version of the Volt. He said that GM could have the version available in the 2012 model year if the carmaker pursues the program. Using E85 fuel, the Volt would use extremely little gasoline, Stephens said. For one thing, most commuters can run on pure electric power to get to and from work. When the internal combustion engine is needed for longer trips, though, with E85, only 15 percent of the fuel is petroleum. The other 85 percent is ethanol, he said. Beginning in December, GM plans to roll out the Volt in seven states over 12 months with limited supplies available for sale and demonstration at Chevrolet dealers. After that time, the Volt would be available nationally. The Volt has a base price of $41,000, including shipping, before a $7,500 federal tax credit. Frank Moultrie, shop chairman of UAW Local 22 representing 960 hourly workers at Detroit-Hamtramck, said there are no immediate plans to add a second shift at the plant. The plant builds the Volt and the Cadillac DTS and Buick Lucerne sedans. The DTS and Lucerne end in 2010. On electricity alone, the Volt achieves the equivalent of 93 mpg. When powered solely by a 1.4-liter gasoline engine, the Volt gets 37 mpg.